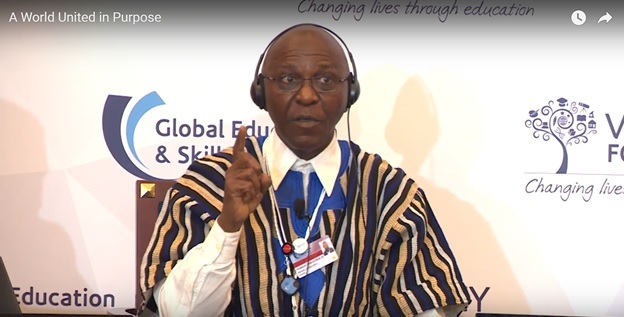 Education Minister Professor D. Ansu Sonii has rated the Private Partnership Program (PPP) in Liberia highly at the Global Skills and Education forum held in Dubai, saying ‘I think it [LEAP] works’. The Liberian Government sent the Education Minister to talk to investors and stakeholders about the success of LEAP and secure further support and donations for the programme so that it could expand across the country impacting more children than the 53,000 currently served. Minister Sonii praised the learning gains, supervision, educational supplies, curriculum enhancement and quality of teachers amongst key reasons to continue the program that has been in Liberia for three years now, though he was quick to mention the financial constraints of the government, admitting they have not being able to deliver their commitments to the PPP. There are currently seven providers initiating the PPP program in Liberia with at least sixty-eight of said schools being run by Bridge, a social enterprise which operates in multiple African countries and is rated effective for student learning outcomes and teacher support and empowerment. The Minister at the sametime praised the school feeding efforts being initiated by World Food Programme, Mary’s Meals and others and said they serve as a way to help reduce out-of-school kids. He said that “No government is able to feed 2 million children, 2 times a day. Maybe some governments, but not mine. So basically the World Food Program, various meal and other folks are helping to feed the much younger kids to that they stay in school. Some of them go to school just because of the food because if they want to stay home there’s no food, the mummy has gone to the market or some place so they go to school. That is encouragement and that has helped us to reduce the out-of-school kids, except for parents and the children themselves deciding not to go to school.” Through initiative such as this the Minister believes that the issue of access has been tackled but the question of outcomes, quality and learning remains a big problem. The Liberian Minister praised and thanked partners under the Liberian Education Advancement Program-LEAP, who are doing exceptionally well and undertaking some of government’s responsibilities which they do not have the resources of finances to deliver like paying teachers, doing renovations and taking care of other administrators. “As far as the number of schools are concerned, access is not too much of a difficulty now, the problem we have is delivering quality. It is that quality that has challenged us. I’m a one year minister and fortunately I have been in university for more than thirty years, and so students that come from the high schools and come to university I know them, and I know where they come from, so are the finishing line for those guys coming from the processing plant, and they have not been well off. Now that they give me the task how do I transform this, we cannot do it alone. However, no government will want to shift all of its responsibilities to a private partner. No government, no responsible government. It’s the matter of sharing the responsibility. In fact, with the involvement of the PPP, the PSL – we call our group the Liberian advancement program LEAP but it’s the same thing – so now the providers under that program receives support. We are supposed to share in that support. All of the teachers on that payroll should be paid by us. All of the school administrators should be paid by the government. Well guess what: we haven’t been able to fulfill our side of the bargain. So those that are maintaining those programs have to fill in that gap, perhaps with expectation that at some point down the road they will be reimbursed, I hope so but if you are never reimbursed then sorry but we still need to proceed with it because the kids are coming along the line. Right now we are a small population. The number of students that are in school right now are approaching 1.8 million and we have encouraged retention and the fact that the kids are staying in school longer that’s what we really wanted. But who is there to deliver the education? I still believe that what has happened the last three years, are significant changes that we’ve seen in the 200 schools that are managed by the private providers supported by the philanthropists and we thank them for it, one for them to please continue.The time will come that a government must be prepared to take a larger portion of education delivery because it’s their responsibility so that that population that comes behind us are prepared to stay on, to stay the course, to find a job,” the Minister continued. Minister Sonii has at the same time announced the commencement of skills training but at the same time thinks primary education at the beginner level remains a paramount beginning effective stage going forward. The Global Education and Skills Forum is an initiative of the Varkey Foundation. The Varkey Foundation believes that every child deserves an inspiring teacher and awards the Global Teacher Prize. This year the Prize was awarded to an African for the first time – Kenyan Peter Tabichi. By bringing together leaders from the public, private and social sectors at the Global Education and Skills Forum, the Varkey Foundation aims to demonstrate that partnership in education is the key to solving global issues.